Over twenty years after the 1989 UN General Assembly vote to open the Convention on the Rights of the Child (CRC) for signature and ratification by UN member states, the United States remains one of only two UN members not to have ratified it. The other is Somalia. Child Rights: The Movement, International Law, and Opposition explores the reasons for this resistance. It details the objections that have arisen to accepting this legally binding international instrument, which presupposes indivisible universal civil, political, economic, social, and cultural rights, and gives children special protection due to their vulnerability. The resistance ranges from isolationist attitudes toward international law and concerns over the fiscal impact of implementation, to the value attached to education in a faith tradition and fears about the academic deterioration of public education. The contributors to the book reveal the significant positive influence that the CRC has had, despite not being ratified, on subjects such as educational research, child psychology, development ethics, normative ethics, and anthropology. The book also explores the growing homeschooling trend, which is often evangelically led in the US, but which is at loggerheads with an equally growing social science-based movement of experts and ethicists pressing for greater autonomy and freedom of expression for children. Looking beyond the US, the book also addresses some of the practical obstacles that have emerged to implementing the CRC in both developed countries (for example, Canada and the United Kingdom) and in poorer nations. 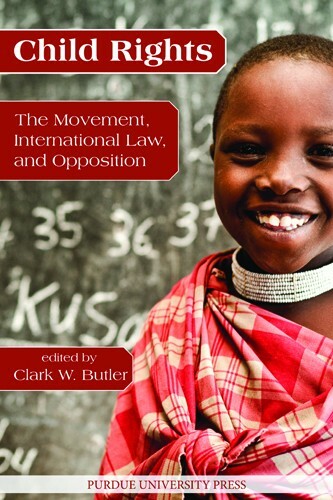 This book, polemical and yet balanced, helps the reader evaluate both positive and the negative implications of this influential piece of international legislation from a variety of ethical, legal, and social science perspectives. Clark Butler, who holds a PhD from the University of Southern California, is a Purdue University philosophy professor based on the Indiana-Purdue Fort Wayne campus (IPFW) and director of the IPFW Center for Applied Ethics. His previous books include Human Rights Ethics: A Rational Approach (Purdue University Press 2008), which proposes a contemporary normative ethical theory in the place of natural law ethics, utilitarianism, and other classical normative ethic theories. His most recent book, The Dialectical Method: A Treatise Hegel Never Wrote (Prometheus Books 2011), reveals a research agenda aimed at continuing the German philosopher’s work in the twenty-first century.